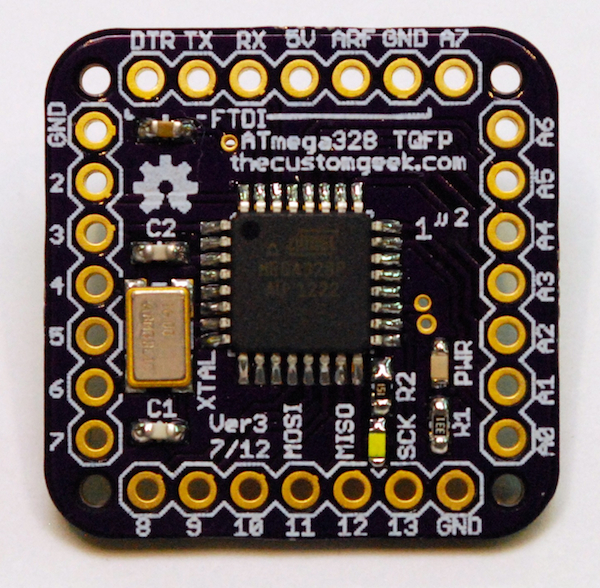 The One Square Inch of Goodness board is an ATmega328P microcontroller in a TQFP package, all pins broken out, 16Mhz crystal, power LED, and (Arduino) pin 13 LED. The pins are broken out with .1″ spacing so you can place (only 2 opposing rows) it in a breadboard. The FTDI compatible pins are broken out in order of the FTDI connector, so any standard FTDI cable/adapter plugs right in. 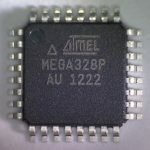 Another advantage of this board using the TQFP package, besides the small size, is that you get access to A6 and A7, 2 analog input pins that you cannot access on an Arduino (because of the PU or DIP package). 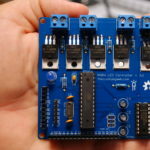 These pins are already built in and recognized by the Arduino IDE. This board is a lifesaver when space is a factor in your project. I have used it in various projects and it works simply awesome. This board runs at 5 volts and consumes about 8mA with the power LED connected. The assembled board comes fully assembled, with an Arduino bootloader. It also comes with headers, but they are not soldered on. The kit comes with an ATmega328P-AU with an Arduino bootloader on it, and the 16MHz crystal soldered on. Check out the tutorial page!